Application for May 3, 2015 Civil Service Exam- Paper-and-Pencil Test (CSE-PPT) for Professional Level and Sub-Professional Level is ongoing starting from November 17, 2014 until March 12, 2015 as announced by Civil Service Commission. The second nationwide Civil Service Exam- Paper-and-Pencil Test is announced to be on October 18, 2015 and the filing of application will be open from May 25, 2015 to September 3, 2015. Please be noted that CSC accepts applicants in a first come, first served basis. 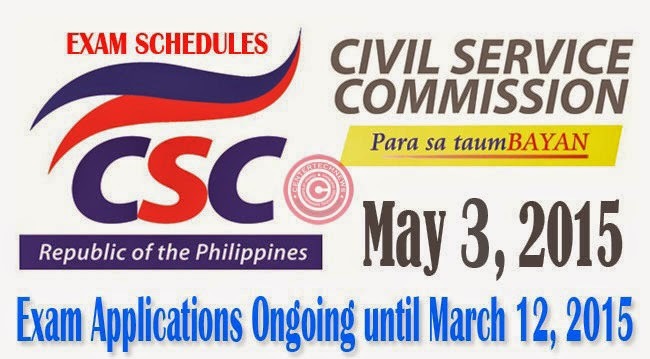 This means that the application period may close earlier than announced if the CSC Regional and Field Office has already reached the maximum number of applications. Passing of CSE-PPT for Professional Level and Sub-Professional Level is one of the requirements to be appointed in first and second level positions in civil service. It can also be a reference of an employer of a private sector. Those taking the Professional Level Test will have three hours to answer questions on English and Filipino Vocabulary, grammar and correct usage, paragraph organization, reading comprehension, analogy and logic, numerical reasoning and general information such as about the Philippine Constitution, environmental protection, Code of Conduct and Ethical Standards for Public Officials and Employees, and human rights issues. CSC applicants must be a Filipino citizen, 18 and above during registration, of good moral character, has not been dishonorably discharged from military or any government civilian position, was not convicted to any offense or crime and has not taken the CSE three months prior the the testing date. The requirements are: dully accomplished application form, four standard passport sized picture with white background complete with hand written nametag and signature over printed name (first name must be written first), original and photocopied valid ID, and Php500 fee. Proper attire must be worn during application. The applicants must file their application where they intend to take the test. Through Online Notice of School Assignment (ONSA), applicants will receive their places of examination 2 weeks before the testing date. Examinees must have a total passing rate of 80 percent to pass the CSE-PPT.